Left: EFF leader Julius Malema. Right: President Cyril Ramaphosa. 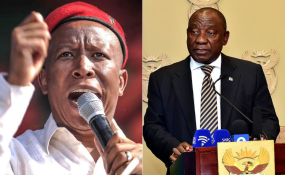 Chaos could erupt again at this year's State of the Nation Address (SONA), Economic Freedom Fighters leader Julius Malema has warned - and this time it could be centred around recent corruption allegations that emerged at the state capture commission of inquiry. Malema warned President Cyril Ramaphosa to come clean on his "dealings with facilities company Bosasa or face a question-and-answer session in Parliament instead of delivering the SONA. The EFF leader was addressing the media at a briefing at the party's headquarters in Braamfontein, Johannesburg on Wednesday. At the state capture commission of inquiry this week, former Bosasa COO Angelo Agrizzi implicated some Cabinet members in state capture, claiming that they accepted bribes. "The EFF is not surprised by revelations of massive acts of corruption levelled by the former COO of Bosasa. Agrizzi's evidence has ushered the country in another level of corruption, money laundering and state capture, facilitated by a powerful white man, [CEO] Gavin Watson". Malema called for the immediate "heightened protection" for the whistleblower. He also called for the resignation of Environmental Affairs Minister Nomvula Mokonyane, saying she has been swimming in a pool of scandals throughout her term as a member of Cabinet. "If the president has to this day not acted on her, it means he too is a beneficiary of her corrupt activities," said Malema. The commander-in-chief also called on the president to "take the country into confidence" by calling a press briefing and providing details of his dealings with Bosasa. But Ramaphosa was having none of it and called Malema's statements "politicking", accusing him of "being an opportunist". "Each side of the story must be heard and those implicated in the commission of inquiry into state capture should be given an opportunity to cross-examine witnesses," the president's spokesperson, Khusela Diko, said. "The president has on various forums made calls that the commission be allowed to work unhindered, and once its report has been tabled, he'll then peruse the recommendations for his attention," Diko added. Malema has now challenged Ramaphosa to provide proof of payment to Bosasa, after his presidential campaign received R500 000. President Ramaphosa's campaign team said it would pay back the R500 000 Bosasa donation that was given to his 2017 ANC presidential campaign. In the same breath, Malema called on the ANC to submit proof of payment, as it was meant to pay back the now liquidated VBS Mutual Bank. The party received money from the collapsed bank.He said he was extremely confident that he and his party were clear of any dubious transactions involving Bosasa or any other business entity. "From all these scandals which have rocked the country recently, from the Guptas, VBS, and Bosasa, the EFF is the only political party that has not received dirty money," Malema said. Malema added that his party held successful manifesto consultations across the country, and believed that those who were part of the process would be happy to note that the party had listened. "Those who were there will realise that we have taken verbatim reasonable points into our manifesto, to be launched on February 2." He said his party's manifesto was not filled with promises, but commitments. Should the party be in power, those commitments would be addressed in no more than three years, he promised. When asked about his recent tweets about backstabbing and traitors, Malema said he tweeted "on his own account talking about his personal life", and that they had nothing to do with the party. "We are no divided", he said. Malema said that his tweets were taken out of context. "To show that we are not divided, our list conference has gone without violence..."
He said the party would closely monitor events in Tshwane and once the time to elect a new mayor came, they would announce their course of action. His statement was made in reference to Mayor Solly Msimanga's announcement of his resignation. Msimanga said he was going to focus on his Gauteng premiership campaign instead.